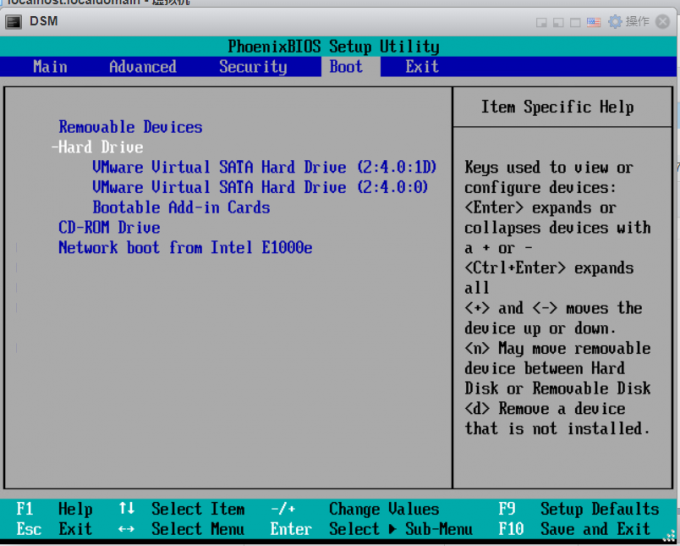 After the DSM was updated to 23824, My Xpenology VM stopped working. Fortunately, I was able to restore it after hours and hours hardworking. Here is a list of all the major issues and their solutions. Hope it can help you. The DSM could not be detected. Bootloader started normally, but NO Network Connection at all. DSM was detected. But "No disk is found " error was displayed after the web portal was loaded. DSM was detected. Disks were found. But installation of the DSM failed because "partition cannot be formatted"
Solution: Move the DATA disks to the first SATA slot, SATA(0,0). Put the Bootloader disk to the last. Another issue you may experience is that the VM cannot boot to the Bootloader after the SATA slots switched. To solve the issue, you need go to BIOS and change the boot sequence.